I found this article on travel tripods written by Jason Schneider over at Imaging Resource. He gives his definition of what he considers to be a travel tripod. Then he gets into the materials and features of what he considers to be a good travel tripod. At the end of the article I am including some links to the most popular travel tripods on Amazon.com. 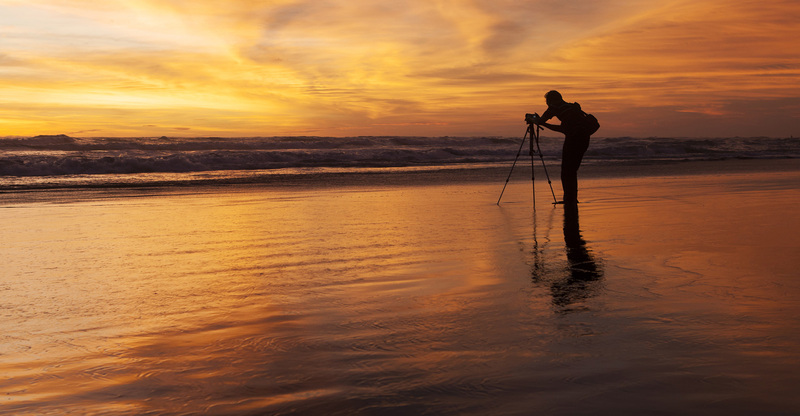 What exactly is a travel tripod anyway? While there is no rigorous, ironclad definition of what constitutes a travel tripod I have come up with my own, based on decades of using them and writing about them, so here goes. In my opinion, to qualify as a travel tripod the unit should have a minimum folded length of 24 inches or less (preferably under 20 inches), a maximum total weight of 4 pounds or so including the head, and extend to at least 50 inches in height without extending the center column more than three quarters of its total vertical length. Tripods that can attain true eye-level height of 60+ inches without overextending their center columns get plus points, as do models that fold to 18 inches or less. In general, if you plan to carry the tripod inside your camera bag the shorter the folded length the better providing the tripod in question provides good stability and leg stops that keep the extended legs securely in position. No travel tripod will provide the Gibraltar-like stability of a large, heavy studio tripod, but that big kahuna in your closet will not do you much good when you’re in the trenches on location. Carbon fiber, magnesium, and titanium great stuff. All are lighter in weight and typically stronger than aluminum. Carbon fiber is rigid and easy to grip at frigid temperatures without losing skin. However all these materials are quite a bit more expensive than aluminum, and their weight advantage, while considerable with larger tripods, may not be all that great when you compare the weights of more compact tripods. By all means buy a carbon fiber/magnesium/titanium travel tripod if that’s what you want and can afford it, but a well-designed aluminum tripod can be as stable and may cost far less. Many travel tripods come with heads included; with others, the head is a separate accessory. With the latter, make sure to include the head when calculating folded length, maximum height, and weight. In general, ball heads stow more compactly and are lighter in weight than comparable three-way heads with a panning handle, but the latter are usually more convenient for shooting video or panning to follow the action. Some ball heads do provide convenient panning action using separate locks for the ball orientation and swivel actions. Check the specs. A majority of compact travel tripods have twist-lock legs, which are self-adjusting and ensure maximum compactness when folded, but some have flip-locks that are a little quicker to set up and fold. Most have 4-section or 5-section legs so they can fold to the minimum length possible. An engineer will tell you that the more leg sections a tripod has, the less its inherent stability, but as a practical matter, the number of leg sections has only a minimal effect on torsional rigidity (the resistance to deformation by twisting), and should not be a major consideration. Leg diameter is important however, and all things being equal larger-diameter legs do enhance stability. Almost all compact travel tripods have simple lift-and-set center posts rather than geared ones, which are usually heavier and bulkier. Many of these center posts are fairly long to achieve a reasonable maximum shooting height. However, the ironclad rule of tripods (which applies to all size and weight classes!) is that the higher you elevate the center post, the more stability is compromised. This consideration is especially critical with compact travel tripods, which tend to have relatively small-diameter center posts. The bottom line: Do not extend the center post any more than you have to, especially when shooting with long lenses, and preferably not more than 4–6 inches at most. If this means bending down a bit rather than shooting at eye level, it’s a small price to pay for the added rigidity. If the tripod provides a hook at the bottom of the center post, hanging a weight (camera bag, etc.) can enhances stability quite a bit, and holding your free hand lightly but firmly on the yoke at the top of the legs at the instant of exposure can also help. Tripods with positive leg stops that let you adjust the leg angle at two or three positions are very convenient when positioning the tripod on uneven terrain. Bubble levels on the head and yoke are a convenience when shooting landscapes and architecture and a compass can be handy. Adjustable leg tips that provide spikes or points for use outdoors and rubber cushions for indoor use are a plus, as is a reversible two-piece center post that provides grounder capability. There are now a number of ingenious tripods with top-hinged legs that pivot 180 degrees on the yoke to achieve considerably more compact dimensions when folded, a concept pioneered by the superb (and expensive!) Gitzo Traveler. Here are three top rated travel tripods on Amazon.com.